Sticking to your New Years Resolutions doesn't have to be a difficult task.Wunderlist, one of Lifehacker's favorite to-do list apps which was just named the Mac App of the Year, is focused on assuring you that you're on the right foot with a 12 month subscription to Wunderlist Pro at 50% off. While an amazing minimalist to-do list that stands on its own for single users, Wunderlist Pro is a great collaborative tool that helps groups stay organized. 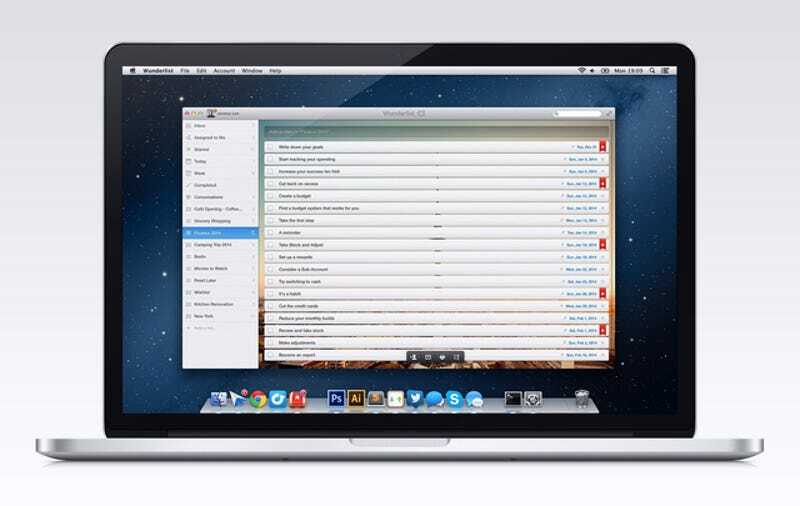 A favorite of Lifehacker's for years, Wunderlist standalone is a simple and easy to use cross-platform list that allows you to create lists, add tasks, select your due date, and search through everything you did or need to do. With Pro, even more is achievable: you've got the collaborating tools at your fingertips (you can assign to-dos to your team), the ability to attach files (photos, spreadsheets, or whatever else), commenting functionality to share feedback and insights, and the ability to create unlimited subtasks especially if you have a monster of a task that needs smaller actionable to-dos. >> While you're thinking of getting geared up for a rocking 2014, get Wunderlist Pro today for 50% off—that's $25 for the year instead of $50. * This special introductory price is valid for new Wunderlist Pro subscribers only, and is limited to a 12 month single subscription. Once the 12 month period has ended, your subscription will be auto renewed at the non promotional price unless cancelled.